Seventy-four years ago this spring, Eva Braun’s world, and life, were coming to their end as Germany succumbed to defeat and ruin. From a bunker under Berlin, she wrote her final letters, to her younger sister, Gretl, and longtime friend Herta Ostermayr Schneider. “Greetings to all my friends. Footage of Eva Braun with her childhood friend, Herta Ostermayr Schneider. On this same day, she chose an action whose significance would only be revealed later, during the war crimes trials in Nuremberg. In testimony there during the Ministry Trials of 1948, a high-ranking German officer credited her with ensuring that one of Hitler’s last desperate orders had come to him, rather than to someone who would actually carry them out. As a result, the lives of about 35,000 Allied prisoners of war were saved. Among them were likely two relatives of mine, and a whole lot of those who were the loved ones of tens of thousands of people. When writing fiction that includes elements of history, accuracy must always trump creative possibilities. It’s been suggested to me several times that Eva Braun’s “character” in the story might be conveyed through letters. However, her very last letter, to her younger sister, Gretl, asked that most of her correspondence be destroyed, and the remaining small amount hidden. It has yet to surface, and those who’ve tried to track it down doubt it ever will. So, any story true to Eva Braun’s consistently private personality must reference only the handful of pieces of her correspondence that are still in existence. And seek, as so many stories do, to find the story of a life between the lines. Categories: The divine in the details, The Munich girl - A novel, This writer's path | Tags: Berlin, Eva Braun, fact and fiction, finding story, Germany, Gretl Braun, Herta Schneider, historical fiction, Hitler's wife, Nuremberg Trials, Phyllis Edgerly Ring, The Munich Girl: A Novel of the Legacies That Outlast War, Third Reich history, writing fiction, WWII fiction | Permalink. I have another chance to be in Europe this spring, and it has made me extra aware of the response of European readers to The Munich Girl. Susanne Weigand, a reader in Germany, writes: “I am German and both my parents have lived through WWII and it was something we often talked about in my family. And in my time at school we were taught a lot about the war and Nazism. Later I read a lot of articles and several books about this dark period of German history. “But for some reason I always shied away from learning more about Eva Braun, probably because I couldn’t understand why a young woman would willingly devote herself to a man like Hitler. So when I learned that Phyllis Edgerly Ring had written a book about her I became very curious. “I like the picture that the author has drawn of Eva Braun, her pride and her ambition, her insecurities and loneliness, her devotion and heartbreaking friendship and the story of her life. Book blogger and reviewer Anne writes: “Growing up in the Netherlands, where every first week of May is basically dedicated to WWII, and with parents who were both born during the war (my mother even before Germany invaded Holland), I thought I was pretty well-informed on the topic. I studied History for two years in which, again, a lot of WWII was covered. Then I started reading this book and realized I still only know so little. “I think I already knew who Eva Braun was when I was around 8 years old, but I never actually knew the face and the story behind the wife of Hitler. I always imagined she was a stern looking lady, with dark brown hair (maybe due to her last name as well) and a riding crop in her hand. Someone to match Hitler perfectly. Now look at the cover of this book. That’s actually Eva Braun. “The Munich Girl tells us the story of three women: Anna (the main character), Peggy (Anna’s mother), and Eva Braun. … The story is told from three different perspectives: Anna’s life in 1995, and Peggy and Eva’s life pre- and post-wartime. There aren’t only fifty plus year old flashbacks, but also flashbacks within 1995 itself: before and after a plane accident (this is no spoiler because the book starts with Anna looking back at the accident) Anna is involved in. I think this is what applied to Eva as well (and is actually a pretty big similarity when it comes to the relationships between Anna and Lowell, and Eva and Hitler). Categories: Creativity and spirit, The Munich girl - A novel, This writer's path | Tags: Europe, Eva Braun, family saga, Germany, healing from the past, historical fiction, readers, Relationships, The Munich Girl: A Novel of the Legacies That Outlast War, women's friendships, WWII fiction | Permalink. When we translate the spiritual inspiration we receive into a genuine act of service, our motivation is most likely one of improving our relationships. But something far deeper also transpires, though it may initially go unnoticed. We are bringing out from the latent state of potentiality our true self and purpose. The genuine acts of service that we have exchanged with another person in this world form the eternal part of our relationship that transcends this material world. The material gifts we exchange with loved ones will return to dust, but the love we show them will last forever. What is the connection between relationships and the concept of investigating our own reality? The personal investigation of one’s reality is an abstract endeavor and it can be difficult to assess progress. However, the more successful we are in uncovering our true self, the better the decisions we will make regarding our lives and the people in them, which translates into healthier and happier relationships. This will provide us with tangible evidence that we are making progress on the path of service and self-discovery. To live to our highest potential, it seems that we need to come into awareness of our true selves and also to establish a balance between our being and our doing that is rooted in our truest purpose. 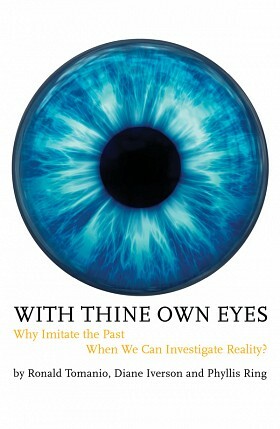 Co-authors Ron Tomanio, Diane Iverson and Phyllis Ring explore these and related themes in With Thine Own Eyes: Why Imitate the Past When We Can Investigate Reality? published by George Ronald Publisher. Categories: Creativity and spirit, On the heart's path, The divine in the details, With Thine Own Eyes | Tags: Awareness, balance, inspiration, investigating reality, Love, potential, purpose, Relationships, service | Permalink. My endlessly patient older sister and me, circa 1960. Many evenings, my parents and I would climb the hillsides above that village to reach the table-like land at the top, where there were old orchards of apple trees. It was a LONG climb, especially on short legs. The reward was the sweet fruit waiting at the end of the climb, and the sunsets visible from that vantage point. That’s a metaphor that has stayed with me for life. Until my sister reminded me of this poem recently, I doubt I’d given it concrete thought for years. Yet when I “heard” it again, something began to play inside me like a song. All through the time and distance I’ve traversed since that German summer, this has traveled with me, setting the roots of the tree of my life into the soil that grew my view of myself, always, as a citizen of the world. I’ve been fortunate enough to return to this village several times with my husband, and even once with our grown children. Although my family lived there a bare eight months, I realize now that the war-weary Germans there who showed me such kindness insured that it’s at the heart of all I’ve loved about their country ever since. Interior of the Baha’i House of Worship, near Frankfurt, Germany. I also know today that because my WWII-veteran father could appreciate Germans, my British mother, injured in the Blitz, could forgive them, and my sister could be so determined to teach me the principle of oneness, my pathway of becoming a Baha’i no doubt began growing from the seed of my life that very summer. Categories: On the heart's path, The divine in the details, This writer's path, World citizenship | Tags: Bahá'u'lláh, compassion, Edwin Markham, Germany, inclusiveness, kindness, oneness, spiritual education, unity, wisdom, `Abdu'l-Bahá | Permalink. From the seed of reality religion has grown into a tree which has put forth leaves and branches, blossoms and fruit. After a time this tree has fallen into a condition of decay. The leaves and blossoms have withered and perished; the tree has become stricken and fruitless. It is not reasonable that man should hold to the old tree, claiming that its life forces are undiminished, its fruit unequaled, its existence eternal. The seed of reality must be sown again in human hearts in order that a new tree may grow therefrom and new divine fruits refresh the world. By this means the nations and peoples now divergent in religion will be brought into unity, imitations will be forsaken, and a universal brotherhood in reality itself will be established. Even though we find a defective branch or leaf upon this tree of humanity or an imperfect blossom, it, nevertheless, belongs to this tree and not to another. Therefore, it is our duty to protect and cultivate this tree until it reaches perfection. If we examine its fruit and find it imperfect, we must strive to make it perfect. There are souls in the human world who are ignorant; we must make them knowing. Some growing upon the tree are weak and ailing; we must assist them toward health and recovery. If they are as infants in development, we must minister to them until they attain maturity. We should never detest and shun them as objectionable and unworthy. We must treat them with honor, respect and kindness; for God has created them and not Satan. They are not manifestations of the wrath of God but evidences of His divine favor. God, the Creator, has endowed them with physical, mental and spiritual qualities that they may seek to know and do His will; therefore, they are not objects of His wrath and condemnation. Categories: Gleanings here and there, On the heart's path, Sustainable Future, The divine in the details, World citizenship | Tags: healing, honor, justice, kindness, Love, mercy, oneness, Promulgation of Universal Peace, respect, seed of Reality, signs of God, souls, tree of humanity, understanding, unity, `Abdu'l-Bahá | Permalink. I am so thankful to share this heart-sustaining Guest Post from writer and blogger Jane Bullock. Her blog, luluopolis, provides daily inspiration (and often delightfully humorous company). Today, these thoughts of hers took my breath away. Ever notice how some birds fly in a sort of formation? They wheel and dip and soar together, and when they are tired of that, they all roost on telephone poles and wires. They also like to cluster in trees together, gossiping and scolding each other. They remind me of old women who love to cluck and complain about the youth of each generation. When I lived in Texas, I became very fond of the birds who liked to perch in the trees next to my apartment. It would be just about the time when the sun started descending into the hills, and the moon would show her shining face to us. It was just as if the birds knew that it was time to settle in for the night, and have their last bit of chatter before sleep. There was a sweet story I heard long ago about birds in the winter. When the days grew cold and there was little shelter for the birds, the little birds would ask the larger birds if they could cuddle up under one of their wings. The body heat of the big bird would keep a little bird warm and safe during a cold night. While many of the big birds allowed this, some did not. When an extremely cold night came, the birds sheltered up together to stay warm. However, there were a few of the big birds who refused to shelter the little ones. When morning came, the sun came out and the air began to warm a bit. All the big birds and the little birds that they sheltered made it through the cold night. But all the big birds who refused to shelter the little ones died of the cold. Even as little as the birds were who sheltered under the wings of larger birds, their tiny warmth kept the big birds alive. And of course, the warmth of the big birds kept the little ones alive. But those who wouldn’t share died cold and alone. This little story always reminds me how of important it is to reach out to others, to share what warmth we have to give, and to cherish the warmth of others. We need each other, not just to weather a hard time, but to remember that we are all in this life together. Categories: Guest posts, On the heart's path, Sustainable Future, The divine in the details, World citizenship | Tags: Appreciation, bird wisdom, birds, care, generosity, giving, Jane Bullock, mutual helpfulness, reaching out, receiving, reciprocity, sharing, sheltering, warming | Permalink. Through the generosity of several kind book bloggers, readers have been finding — and responding to — excerpts from my novel, The Munich Girl. As I reached for Eva’s hand, the door to the main corridor slid open and the conductor seemed to fill it with his blue uniform. “Where did you come from?” he asked my companion accusingly. I smelled schnapps on his breath. And saw tears gleam in Eva’s blue eyes. “With no one there to help, she barely made it on board,” I accused. Nodding quickly, her expression like a chastened child’s, she started digging in her leather shoulder bag. The conductor was weaving in the doorway, tapping his boot impatiently. Just like most of these useless bloody uniforms, throwing their authority around. God help you if you actually need their help. They’ll be too busy having a nip and a smoke out of sight, as this joker obviously had. Probably been drinking since we’d left Linz—he’d even neglected to announce some of the stops. I took great satisfaction in saying this, though I did so in English. Across from me, recognition sparkled in Eva’s eyes. “A little over an hour,” he mumbled. When he lurched back, the door his bulky frame had propped open slid closed with a thump. Now that she’d touched on one of my favorite subjects, the time and kilometers flew past as we talked about actors and music, jazz, dancing—and clothes. When I pulled out a movie magazine for us to look at, her chubby face came alive as she offered succinct assessments of the actresses’ clothes. “Sounds like we’ve made the same decision. I’m not going back, either.” The thought of the scene that likely followed my unexpected departure last night launched a plummeting sensation in my stomach. I stopped, suddenly. What was I doing? I never talked about the divorce. Might as well get it over with. I’d probably never see her again anyway. She reached across the gap between our seats for my hand. “My brother was killed, just before his nineteenth birthday. Right near the end of the war.” My voice was suddenly growing tight. “I am so very sorry.” Eva moved to the seat beside mine and was offering a soft handkerchief. I had seen it before it happened, that final end that was so horrible not only for Peter, but so many others lying there around him in that muddy, hellish mess. That place I didn’t want to see. Didn’t want to look. But it had kept coming back. When I had tried to tell them—beg them—not to let him go, Father had called it morbid. Wicked. Been enraged that I would even suggest the danger that loomed. Then, afterward, he’d looked at me as though I’d made that terrible thing happen to Peter, simply because I’d seen it ahead of time. And tried to warn them. Categories: The Munich girl - A novel, This writer's path | Tags: Eva Braun, Fiction, Hitler's mistress, novel excerpt, The Munich Girl: A Novel of the Legacies That Outlast War, Third Reich history, wartime Germany, women's friendships fiction, WWII historical fiction | Permalink.